These are easier pieces designed for students to develop breath control, range, and lyric expression. 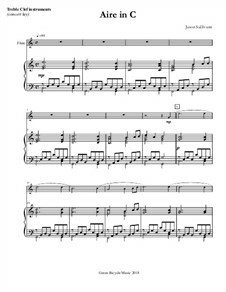 This version is for Flute or Treble clef instruments in C (esp. Violin, perhaps Oboe too). Only the third Aire is a little more difficult, with an extended form. The first two have been played as Church offertories as well. These are easier pieces designed to help beginning players develop breath control (or vibrato-sustain), range, and lyric expression. This version is for bass clef instruments in C ('Cello, Bassoon, Baritone, Trombone). Only the third one is a bit more difficult; they should be learned in sequence. They are suitable for studio recitals, Church services, or even master or performance classes.